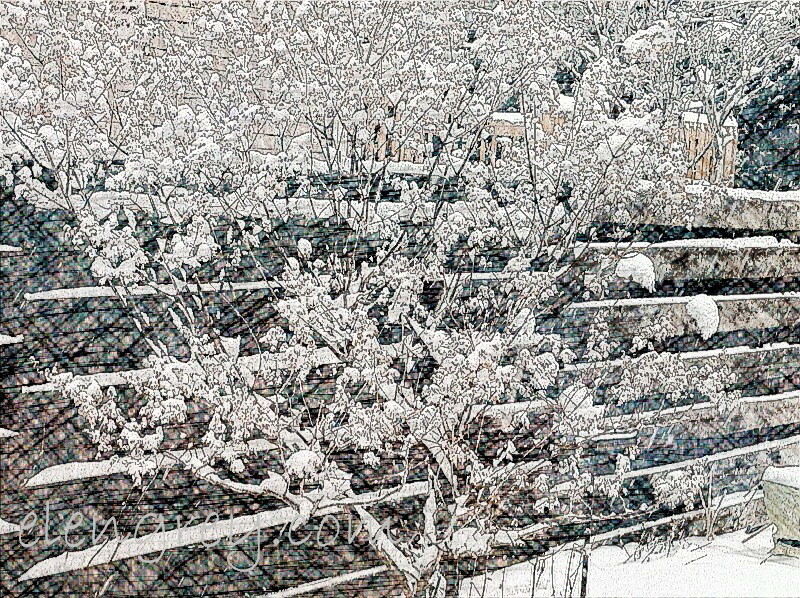 We’re having a wee bit of snow today. I almost believe I live in the Great White North. 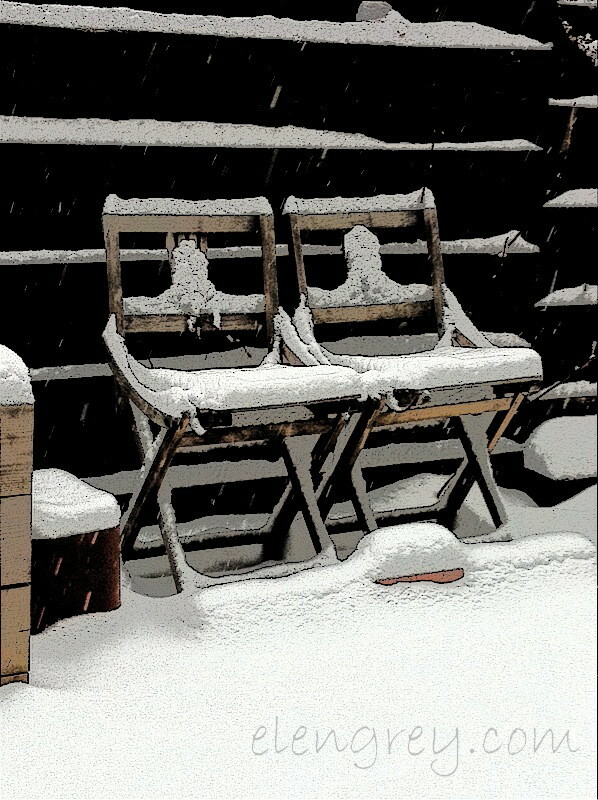 These are salvage chairs, and they sit it my garden year round. Sometimes, there are pumpkins and gourds resting on them. Sometimes, there are herbs or showy little annuals. And sometimes, there’s a pigmunk or zombie squirrel. 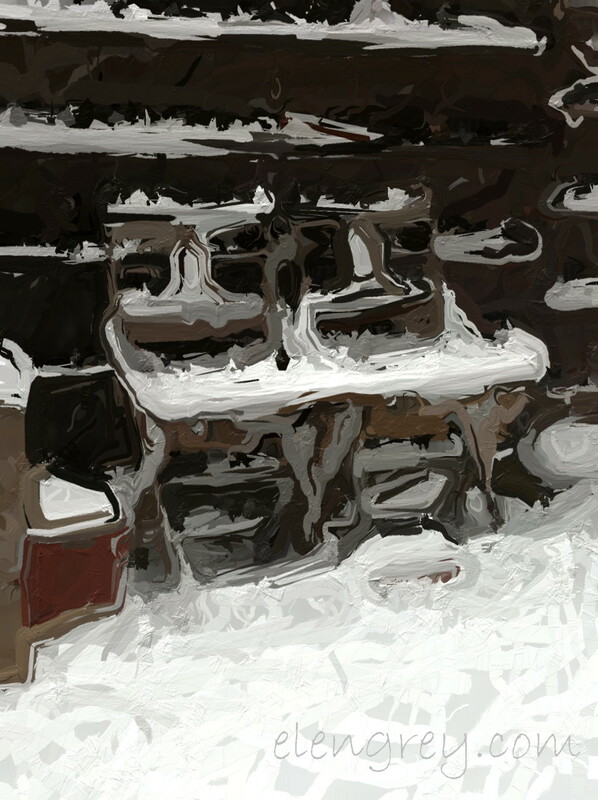 There are more than a few camera apps on my smartphone, but I still have a thang for Cartoonatic. Even the naked winter hydrangea looks good. Who’s got some great camera apps? Tell me. Tell me now. ← Single Shot Monday: Makes Me Think of Cake! Oh do I have apps!! iColorama , Leonardo, mextures, Pixkr. Those are my go to’s. You can do layers with masks on Leonardo! And I’ll be checking all these, because I’ve seen what you can do!! Oh, good. More camera apps to check out. I’m making a list. I’ve got Snapseed. Thanks for stopping by and taking the time to leave a comment. I do enjoy your blog. Cheers! Irony have the patience to experiment with a lot of apps, perhaps someday I’ll be apt to try it. So I stick with my ol’ buddy ‘Camera+’. It cost $3 US, probably $9.99 C, but it’s worth it. Do you know if it?